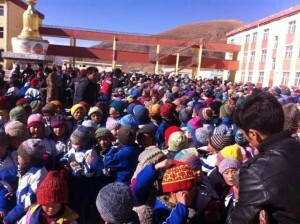 Wool-Aid continues to support the children in Tibet with regular shipments throughout the year. The Tibetan plateau is the highest region on Earth, and is subject to extremely low temperatures in the winter. Our Wool-Aid items are typically distributed to children at selected schools during the winter months. During the summer months, our shipments are held until time for distribution. Wool-Aid’s focus for Tibetan children is for children who are of school age — about 8 years old through teens. These children are often outside in the bitter cold weather, and they really need protection from the elements. We most often send hats, socks, sweaters, and vests to Tibet. While the colors of maroon and gold have special significance in Tibetan culture, the children in Kyegu love to receive our warm items in all colors and patterns. Many thanks to all who have contributed to this effort!